QI GONG - Breathe with me! The second word, Gong, pronounced kung, means accomplishment, or skill that is cultivated through steady practice. Together, Qigong (Chi Kung) means cultivating energy, it is a system practiced for health maintenance, healing and increasing vitality. Qi Gong can heal the body and help heal others. Qigong practices can be classified as martial, medical, or spiritual. Some practices increase the Qi; others circulate it, use it to cleanse and heal the body, store it, or emit Qi to help heal others. Practices vary from the soft internal styles such as Tai Chi; to the external, vigorous styles such as Kung Fu. However, the slow gentle movements of most Qigong forms can be easily adapted, even for the physically challenged and can be practiced by all age groups. Like any other system of health care, Qigong is not a panacea, but it is certainly a highly effective health care practice. Many health care professionals recommend Qigong as an important form of alternative complementary medicine. Benefits of Qi Gong: Vitality, positive outlook and greater harmony. Anyone can enrich their lives by adding Qigong to their daily routine, while you are standing, sitting or laying down - It's easy. Children learning to channel their energy and develop increased concentration; office workers learning Qigong to reduce stress; seniors participating in gentle movements to enhance balance and their quality of life; caregivers embracing a practice to develop their ability to help others; prisons instituting Qigong programs to restore balance in inmates lives; midwives using Qigong techniques to ease child birth. 2. Make a List. Make a list of what you need to accomplish then pick three things and do them. Some people with pick the most difficult items and others will pick the easiest. It does not matter. What does matter is that sense of accomplishment once you are done. So instead of working on a lot of things at once and getting none done, finish those three things then rejoice in knowing that you achieved a modicum of success. 3. Shout less. Shouting (or yelling) is a natural reaction to stress. We all do it. The thing about shouting, however, is that it creates even more stress. Case in point; try raising your voice – okay yell – and watch what happens to little kids or even dogs when that happens. You can almost see them withdraw visually within themselves or in some cases, go hide. So take a breath, count to 3 and lower your voice. 4. Care About Something. If life is a mess and you feel out of control, find something to care about that you can control. This will not eliminate the crisis or any stress or fear you may be feeling, but it will help distract you from the instigating circumstances and allow you to divert your focus to something positive. 5. Stop and Savor the Small Things. There is reason people enjoy chocolate and other treats. The addictive qualities of caffeine not withstanding, stepping away for even ten minutes and enjoying a cup of raspberry tea or a piece of yummy chocolate. Even a phone call with a close friend or a short nap may give you enough of a break to compose yourself and set you on a path to get things done rather than stress about the never ending list of to-do’s. These are small things but being small does not diminish their importance in helping you feel balanced. 6. Pick your battles. Let’s face it – some battles are not worth fighting. You would think that it would be easy to fight it out and then be done with it. But scraping and fighting are tiresome – whether it involves nagging your spouse or your kids to do their chores or whether it is a battle with yourself to get just one more thing done at the end of the day. 7. Unplug from your Digital Life. Turn off the computer, the iPad, the cell phone and the TV. The digital world seems to be everywhere but that particular flavor of “everywhere” is not always a good place to be. Make friends with yourself again by stepping away and learning the merits of enjoying time and space in it’s own right without the flash and dash of a screen. And while you are unplugged, why not try a bit of one-to-one interaction with another human or a pet? 8. Be Silly and Go Play. Act like a kid. Giggle. When everything around you is serious, laugh. Remember the childhood game ”kick the can”? Well get an old can and kick it. That is what I mean by silly. Do something no sane grownup will do and you just might re-discover the inner kid again – the happy, less stressed-out little kid. Having too much stuff goes far beyond the physical properties of having stuff. Too much can also relate to too much to do and the spiral of defeat that “toomuchness” brings. If you are afflicted with so much to do that your head hurts, try some of these tips and remember, your feelings are normal, you are not mentally off balance, your symptoms are not uncommon and most of all, being overwhelmed when it is all too much is not incurable and with time it will pass. So how about you? Do you have some coping tips to add to the list? 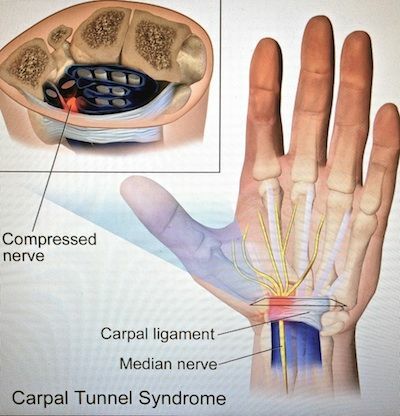 YOU'RE ON MY LAST NERVE - Can texting cause Carpal Tunnel Syndrome? "Sit straight!" - 'Watch your posture" "Shoulders back" - I remember those commands all to well. Learn what our spine has to do with arms and wrist and what it can cause..
We have four spinal curves naturally, with the cervical Spine the most flexible one. Most nerves emerge from the cervical and the lumbar spine to innovate our muscles and organs.Since Mankind decided to walk erect, we are always fighting gravity. And since the invention of the Internet: we definitely are on the short end of the stick when it comes to posture. Not only bring we our shoulders more forward to reach to the keyboard, our head also moves more forward to see what we are actually doing on the screen. Bingo and Bingo: by changing the curve of the cervical spine the pathways of nerves and blood vessels are altered due to adjustment of our upper body to accommodate the task. There are quite a few entrapment and impingement sites for the Brachial Nerve in your arm, starting at your neck, inner arm, elbow and last but not least, the carpal tunnel. That nerve has to travel through that tunnel to move your fingers. Posture changes, repetitive tasks with fingers hand and wrist may lead to narrowing of the tunnel. Nerve gets entrapped (compressed by soft tissue) or impinged (compressed by bone) leading to inflammation of the nerve tissue and possibly the surrounding tissues. That's not all folks, now TEXTING tops it with overuse of the thumb muscles and constant flexing (deviation) of the wrist. DeQuervains disease might be a result of that. On the first onset of Carpal Tunnel or DeQuervains rest and ice is suggested. For chronic conditions treatments include reducing the inflammation, increasing Range of Motion and decreasing pain and discomfort. Self Care include hot and cold compresses, wrist bandages and pain relieving applications. Medical massage addresses the surrounding tissues, muscles and tendons to increase circulation because blood and lymph are the best caregivers in the body for healing. Different modalities like kneading, Trigger point therapy, Acupressure, Neuromuscular Facilitation and Myofascial Release Technique may enhance the treatment plan. Natural remedies i.e.stretches, Hydro and Thermal therapy, pain relieving essential oils and herbs may be applied. Tension headaches are headaches with muscular origins and are asociated with trigger points and other myofascial pain syndromes arising from structures in the head, neck and spine. Chronic daily headaches tend to have accompanying shoulder and scapular pain. The frequency is variable, episodic and can last from 30 minutes to weeks. Associated symptoms are muscle tenderness and stiffness, hypertonicity in the affected muscles and in some cases loss of appetite, nausea, vertigo and tinnitus. Aggravating factors include stress, fatigue, cold, hypoglycemia and poor posture or decrease in range of motion of the head and neck. 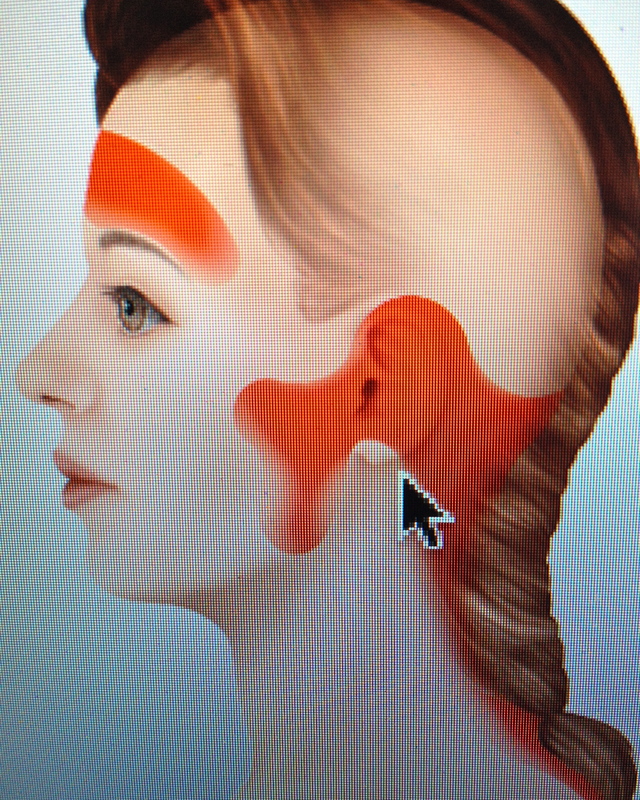 Infections such as herpes simplex or sinusitis can perpetuate trigger points. With Migraines the pathophysiology and symptoms are different, but the same tissue is involved. Therapeutic Massage addresses the affected soft tissue in your back, neck and shoulders. I recommend three (3) consecutive sessions not more than 10 days apart to break the body's cycle to fall back in its pattern. Waking up and can't turn your head without a thousand bullets shooting into your eyes or brain? A very common condition. Usually your head is tilted towards the affected side, but your face looks the other way. And your Shoulder of the affected side is raised. One can be born like this (congenital Torticollis) but most of us acquire it from a draft, open window, awkward sleeping position, holding a phone or a combination of the above. Pain is felt if a muscle containing an active trigger point is actively or passively stretched, setting of a protective muscle spasm to prevent further lengthening by creating a shooting pain. What you can do yourself: deep breathing and applying heat to increase blood circulation. Make a Massage appointment. Sometimes the muscle in spasm is too sensitive to work on, so neurological fascilitation (PNF) or tendon release techniques are used to make the affected muscle relaxed and workable. In most cases takes more than one session to relax the affected muscle. Different modalities can be used and lots of hot towels and sometimes herbal infusion. Number one goal is to decrease the pain and increase your range of motion, so you can attend your daily activities with less discomfort. The Fall Season brings on many races, walks for charity and marathons. With the cooler season upon us our tissues also slowly change and we need warm up more and dress properly. For most Athletes the Runner’s Knee is the common name for a type of knee pain that impacts runners. It can affect every one of us, exercisers and non-exercisers, any age group, even young adults and children, because it relates to the way that the kneecap is moving on the leg. When the kneecap is not moving properly due to an imbalance of muscle strength or movement, it can slide or move over the femur, which is the large bone of the thigh. When that happens, the cartilage that protects the bones from directly rubbing against each other becomes damaged from the additional friction or pressure causing pain around the knee. A key reason that the problem can develop in athletes and non-athletes is biomechanical error. An imbalance in the quadriceps can cause the kneecap being pulled off center and either moves toward the right or toward the left, depending on the muscles that are weaker. A weak muscle group causes the same situation, but may be more or less pronounced depending on the specific muscle. In many cases, strengthening exercises that focus on the quads can help. If the Iliotibial Band (IT band) is tight, then it can also throw off the alignment of the kneecap. The Iliotibial Band (IT band) is a fibrous tissue that helps stabilize the knees. When it is tight, the stability is thrown off and the kneecap is no longer aligned properly with the rest of the bones. The hamstrings are just as important as the quads when it comes to the kneecap, so weak hamstring muscles or muscles that are not balanced with the quads may also contribute to the problem. When the hamstrings are weak, the rest of the muscles in the legs are working harder. As a result, they tighten up and put more pressure on the femur. Although several factors can contribute to the development of the condition, it is important to identify the potential symptoms of the problem to start taking measures to correct it. - supportive measures as rest and a sports specific massage tailored to the individual need is a great tool to feel well again. First, when you see a medical term ending with '-itis' it means 'inflammation', i.e. Bursitis, Tendonitis, it is an inflammation of the bursa, a tendon, and in today's case an inflammation of the Plantar fascia. Plantar fascia is a tissue (padding) on the sole of your foot connecting the heel bone to the ball of the foot (i.e. metatarsals). It functions as a passive bowstring during the midstance phase of the gait cycle. This shortens and raises the arch in your foot. The same effect occurs when a standing person goes up on the toes, causing weight bearing through the ball of the foot (i.e. high heels/stilettos, ballet dancer). The fat pad on and around your heel bone (calcaneus) is to cushion the bone during the initial contact phase of the gait cycle. The muscles of the lower leg, especially the soleus and gastrocnemius (calf muscles) also help to control shock absorption when walking or running. 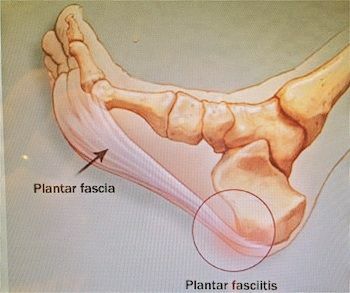 The fat pad on the heel bone and the plantar fascia are connected but you can develop plantar fasciitis without a heel spur and vice versa, but not to uncommon to suffer from both. Plantar fasciitis: Tension is placed on the plantar fascia with repeated use. Poor bio mechanics, tight calf muscles, improper footwear and weight gain including pregnancy seem to be the leading causes. Over time, the plantar fascia is unable to repair itself and partially torn off the calcaneus. That pulling on the bone might create a heelspur. After an initial period of acute inflammation, chronic inflammation sets in, due to adhesions and hardening and thickening of the fascia. Pain is the worst after a resting period, gets better after a few minutes and comes back after a couple of hours. Chronic inflammation: no aggravating activities, ice to plantar fascia, heat to calf muscles, kneading and light stretching of lower leg and foot. Ask your Massage Therapist for detailed how-to with your massage! Heat and cold therapy, Myofascial Release Techniques and other Massage strokes are used to increase blood flow, increase range of motion and to decrease pain, You will be in good hands. Feel well again! Generalized muscular aches and pains for months? Stiffness, and increased level of fatigue, poor sleep, intolerance to cold, a swollen feeling in tissue, anxiety, palpitations, altered sensation such as numbness, tingling or pins and needles usually in the extremities, dry eyes and mouth, skin sensitivities and problems with memory and concentration, headaches, migraine, TMJ, chronic fatigue syndrome....These are all symptoms of FIBROMYALGIA. Fibromyalgia is a painful non-articular rheumatic condition of at least three months' duration, characterized by widespread muscular achiness and specifically the palpation of tender points at 11 of 18 prescribed locations on the body. The causes of fibromyalgia are not clear but there seem to be connections with immune abnormalities and a genetic predisposition to neuroendocrine dysfunction, including a deficiency of serotonin. symptoms can be triggered or aggravated by overexertion, lack of exercise, stress, anxiety, depression, lack of or poor quality of sleep, trauma, extremes of temperature or humidity (especially cold and wet weather) and infectious illness. CFS is a condition distinguished by persistent fatigue that does not resolve (not even with sleep) and severely reduces activity levels for at least six months. The cause of CFS is not well understood. It is thought to be related to some other viral or infective source. There is a deficiency of T-lymphocytes (your natural killer cells). And there is a link to fibromyalgia, which is frequently found in people with CFS, but how the two are connected is unclear. Studies have shown that CFS and FBM that massage increased sleep, while anxiety and depression levels were reduced. it also can help to relieve muscular pain and reduce stress levels. Focus is on light pressure and relaxation techniques. Warm or hot towels offer temporary relief. Epsom salt baths, heating pads, german chamomille /lavender/marjoram or rosemary esstial oils, self massage to the abdomen, a visit to a Naturopath may help with strengthening the immune system, breathing techniques, strengthening light exercise with stretching. Ask your Massage Therapist for details and book your Massage. Rotator cuff injuries occur most often in people who repeatedly perform overhead motions in their jobs or sports. Examples include painters, carpenters, and people who play baseball or tennis, Raking and shoveling snow. The risk of rotator cuff injury also increases with age. Rotator Cuff injuries can range from mild inflammation to complete tears. 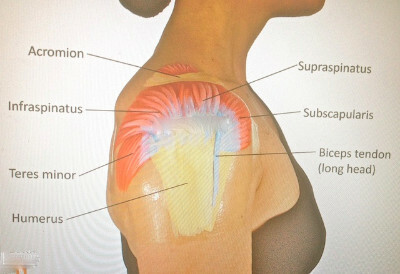 Impingement of a tendon or shoulder bursa is not uncommon. Medically, tears are treated by open rotator cuff repair surgery (Acromioplasty) and the rotator cuff tendons are reattached to the humerus. MASSAGE: In the chronic stage of inflammation Massage is most beneficial to break adhesions and to increase the blood flow in the area. Pain-free passive relaxed range of motion is used on the joints, Hydrotherapy including deep moist heat to soften adhesions, gentle friction and Trigger point therapy. SELF-CARE: Gentle stretching, self-massage, skin rolling, modifying sport and occupational activities, Hydrotherapy. And of course....your MassageClinic is here to help with a Therapeutic Massage. There are a variety of symptoms that characterize low back pain: these can range in severity from mild discomfort to intense, debilitating pain. The pain can be dull or sharp, localized or diffuse, intermittent or fairly constant. Certain symptoms are accepted hallmarks of specific problems - such as the radiating pain of sciatica - while other causes may be harder to pin down based on the symptoms reported. No matter what the causes, however, clients who seek massage therapy to help alleviate their lower back pain are making a wise choice. A research study published in Scientific World Journal showed massage therapy can be of significant help to people with lower back pain, leading to faster recovery and allowing them to reduce their need for anti-inflammatory drugs. ACUTE LOWER BACK PAIN: mostly short term and results from back muscle or ligament strain due to unusual movement or stress like heavy lifting, sudden movements, twisting etc. CHRONIC LOWER BACK PAIN: People with longer than 12 weeks with lower back pain are considered to be in chronic stage. The cause can differ widely, but has one in common: a disorder of the structural elements of the lower spine and the nerves associated with that area of the body. A common feature of chronic low back pain is SCIATICA, an intermittent or constant pain on one side of the lower body only and is more noticeable in the buttock, thigh, leg or foot than in the back itself. The pain is more severe, with a stinging or burning sensation rather than one that is achy or dull and can occur after prolonged periods of sitting or standing still. 'MASSAGE THERAPY was superior to other modalities in helping individuals with chronic, non-specific low back pain, especially when combined with a program of self care exercises (i.e. 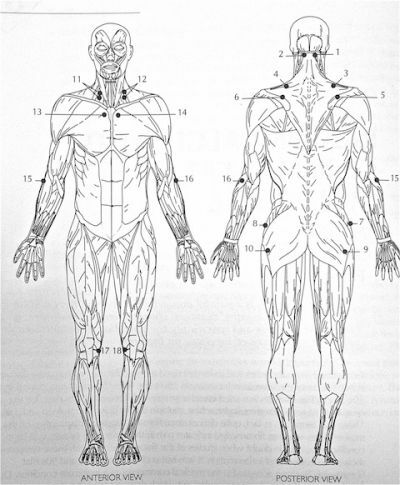 stretches) and education (i.e.Body mechanics)' the Furlan Review Peer stated earlier this year. Book your Massage now and tell a friend!